Dies ist der Rückzug unserer Familie von der Hektik der modernen Welt. Es ist ein Ort, an Abgeschiedenheit und Ruhe genießen. Es gibt keine Straßen auf unserer Seite des Guanaja, nur Pfade und Boote. Unsere "Vorgarten" ist die Karibik. Riffen umgeben uns auf beiden Seiten und die Barrier Reef ist etwa einen Kilometer entfernt. Die landschaftliche Schönheit ist atemberaubend. Die Riffe wimmelt das Leben - tropische Fische, Aale, Rochen, Meeresschildkröten und Ammenhai. Das Wasser ist klar, blau und unberührte. Einer packt einfach eine Maske und Schnorchel und köpft aus - keine lange Bootsfahrten, um dorthin zu gelangen. Die Gelassenheit und ruhige Abgeschiedenheit erstreckt sich über den Strand, um die umliegenden Wanderwegen gehören. Die Kabine ist direkt am Strand gelegen. Es ist ein ein Schlafzimmer, mit einem Futon im Wohnzimmer. Die Kabine ist mit Klimaanlage, Ventilatoren in jedem Zimmer. Die Küche ist komplett Ausrüstung. Da wir auf der Nordwestseite der Guanaja gelegen, sind wir gesegnet mit einigen spektakulären Sonnenuntergänge. Genießen Sie Ihren Kaffee oder Ihr Getränk am Abend auf der Veranda sitzen das Meer beobachten. Die Miete beinhaltet Nutzung unserer Schnorchelausrüstung und Kajaks. Komm, schließe dich uns an. Guanaja ist nicht leicht, zu reisen. Sie ist ein seltenes, ein einzigartig und ein Verschwinden Juwel in der Karibik. Wenn Sie schauen, um "aus dem Netz" zu bekommen, ist Guanaja die Reise wert. Sie können sogar entscheiden, zu bleiben. Wilmont Bay is remote. If you enjoy privacy, a private beach and beautiful clear waters with coral reefs and sunsets, then you will enjoy Wilmont Bay. The Caribbean as it should be !!! Wilmont Bay Retreat is the perfect place to stay on the perfect Caribbean Island to visit (Guanaja). This is the kind of place to go if you love nature, a pristine environment, and a lot of outdoor activities to participate in. It is not a place where you will be one of thousands of tourists trying to "hit all of the highlights" of a beach destination in a few short hours (cruise ports come to mind). If shopping malls and casinos are your preference, you better go elsewhere. Guanaja may be a little more difficult to get to than a lot of other Caribbean destinations, but that is probably what has enabled it to remain an unspoiled and off the beaten path kind of a destination. The extra effort is definitely worth it. Guanaja (and Wilmont Bay Retreat) are true tropical gems, and some of the few remaining ones in the Caribbean today. Activities that I participate in are Diving, Snorkeling, Kayaking, and Hiking, all of which are top-notch, with no crowds to deal with. You host (Cindy) does an excellent job acquiring your groceries before you arrive, which allows you more time for engaging in all of the activities that are awaiting you. One of my favorite times at Wilmont Bay Retreat is about 8pm - 10pm when it gets dark and the stars shine brightly overhead (and the waves roll onto shore). An hour or two of this relaxes the soul and prepares you for a great night's sleep on the extremely comfortable beds in the cottages. We have stayed at Wilmont Bay Retreat twice over the last few months and plan on going back every year, as often as we can. You will feel the same way once you have visited. I have stayed in many places on many islands and this is one of my favorites !!! Guanaja is a beautiful part of the world, and Wilmont Bay is perfectly suited to experience it at it's best. The snorkeling at the door step is among the best we've experienced, as are the sunsets—two green flashes in seven days! Travel in Guanaja is mostly by boat, which is an adventure in its own right, and Jorge will happily and skillfully get you anywhere you would want to go. While you are not alone at Wilmont bay, one could hardly be call it crowded. In addition to the two Cabins, there's just a few private homes in the area. The cabins are well stocked with all the necessities for an independent traveler (full kitchen, shower, fans, even an air conditioning if you need it) and are quite comfortable. Both Cindy and Jorge are wonderful hosts, and will make every effort to ensure you have a great trip. Bonaca is a fascinating and unique city built on two small Cayes--well worth the visit included in your stay, as is the near by waterfall (not included, but quite affordable). A trip along the coast by kayak is also quite rewarding—depending on the day, you may not see another soul. This isn't the place to go if you want to lounge on the beach (sandflies will not allow that) and be served hand and foot (this isn’t a resort, which for us was a large part of the draw). But if you are looking to relax, explore a near empty coastline, and enjoy healthy reefs just steps away, this is a great choice. For us, it surpassed all expectations. P.S.—Though you can get along just fine speaking only English, at least since Mitch, many mainland Hondurans now live and work in the area. As such, we found a bit of Spanish went along way in certain circumstances. So we’d suggest, if it is not your first language, you brush up. 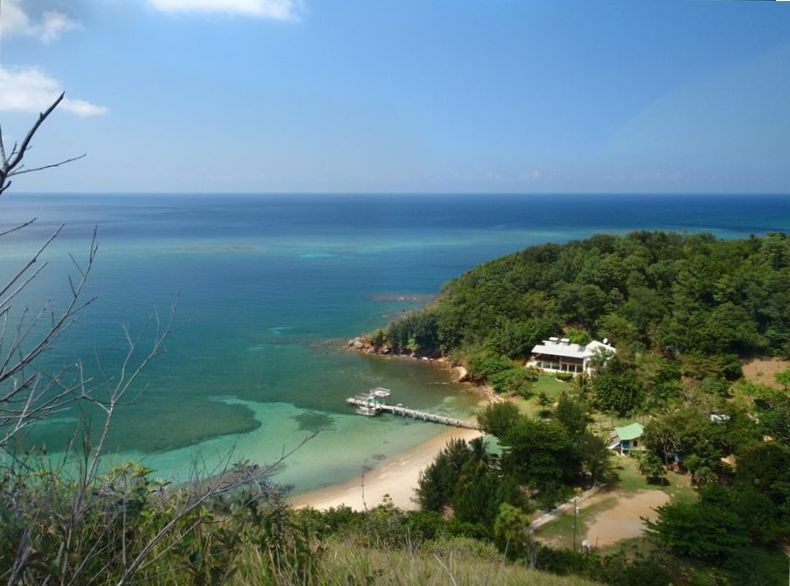 If you are looking for a vacation on a quiet secluded island, we highly recommend this place. We stayed in one of the two cute, comfortable cabanas for a week, and it wasn't nearly long enough. Cindy and Jorge were amazing hosts - boating us to the flats for fishing, guiding us on a hike up to the waterfalls and taking us on a tour of the island's market. The cabin is clean and has an wonderful porch for lounging. The bedrooms have air conditioning, though we preferred to turn on the overhead fans. Cindy stocks the refrigerator with food, which is a wonderful service as the nearest grocery story is a boat ride away. This VRBO is on its own bay with sandy beach and some of the best snorkeling in all of the Bay Islands. The cabin comes with two singles and a double kayak. The next bay down as an isolated beach where you can walk for over a mile and not see another person. Plan on making your own meals, as there are no restaurants within walking distance. Cindy also helped us navigate the flight schedule from Roatan, which can be a bit tricky, and provided transportation to the cabin. If you are looking for a quiet stay and the opportunity to truly unplug (wireless internet is available, though it's best to leave technology behind), this is the place. We give it 5+ stars! Now that it's possible to fly to Guanaja from the US mid-Atlantic in one day, we found the flights relatively easy. Our charter with David between Roatan and Guanaja was definitely worth it. No worries about missing key flights to and from the US. Of course it was Cindy, our superlative hostess at Wilmont Bay, who gave us this bit of travel advice. She made arrangements for us many times for everything from fishing, diving and snorkeling trips, Thursdays shopping in Bonacca, to Saturday afternoon supper at Manati. She shared delicious meals, kept an eye on weather reports for diving trips, introduced us to many local friends, and suggested excursions we might enjoy -- all with perfect attendance to our privacy in the little cabin. Wilmont Bay is not for everyone, especially if you require more exciting night life than star-gazing, a midnight dip in the sea, quiet reading, or watching movies from Cindy's large selection. The pace of life was perfect for us. We enjoy cooking "at home." We savored many delicious local seafood meals -- mahi-mahi, red snapper, wahoo, yellow-eyed snapper, shrimp, bonita, barricuda. Swimming throughout the day in Wilmont Bay, hiking, kayaking, walking the beach, simply reading on the porch swing, or watching lots of gorgeous sunsets, were all delightful. We enjoyed the changing weather as well. "Northers" bringing agitated surf and wind were followed by picture-perfect calm sunny days. Local folks could not be more attentive to our every need. Jorge was indispensable whether it was helping with kayaks, motoring us to great snorkeling sites, or driving us over the hill to the canal. Jackie skippered the Nimitz, assisted on diving trips, and filleted fish to perfection. Bill Blakey was the perfect dive master. What diver could ask for more than one-on-one trips to some of the most spectacular diving sights? Snorkeling right off our beach was equally spectacular. We have snorkeled and dived throughout the Caribbean. Our experience here was the best ever -- crystal clear water, healthy coral, a myriad of fish species many in large schools, and multiple turtle sitings. Then there were the local birds. You will not see more hummingbirds anywhere. Green parrots and Cindy's menagerie of chickens and geese were entertaining as well. We have never done a review. It is with mixed impetus. Wilmont Bay Retreat was perfect for us, but sharing its discovery may mean it will become less remote and too accessible. Thanks, Cindy and Charles. Adventure on this beautiful island paradise! My family had a wonderful adventure on this beautiful island paradise! The natural beauty surrounding us was amazing! Cindy had arranged for us to fly from Roatan to Guanaja in a private Cessna piloted by David, and what a fantastic view of the island and the sea from the air! She met us at the landing strip with Jorge driving the boat and we headed to Wilmont Bay retreat! Our cabins were perfect - very comfortable, stocked by Cindy with groceries and everything we needed! Cindy treated us with exceptional hospitality and friendship, and always went the extra mile to make sure our time there was memorable! We spent an evening getting to know many of the locals and ex-pats at a festival celebration. We enjoyed delicious meals with Charles and Cindy. We spent time exploring the deep blue sea on the Nimitz with Captain Jackie. We made a trip to "town" by boat to restock groceries. Bill, an excellent instructor, led my husband and son on a recreational dive, while Cindy guided me and my daughter snorkeling through the magnificent coral reeds with endless, colorful and fascinating sea life! What an experience! We enjoyed a tasty lunch at Bo's Island House on a pier over the water. We hiked up to a beautiful and refreshing waterfall! ... Have I mentioned the spectacular sunsets? And the interesting animals and wildlife around our cabin including Angel, our guardian dog, playful and lazy cats, many singing birds and hummingbirds, chickens, ducks, geese, a small barracuda that was a regular visitor around the dock, and a captivating parrot! My family spent our last afternoon there, including Cindy and a friend we met, snorkeling through the majestic coal reefs right off the beach from our front door! That was the highlight of our island adventure! Thank you, Charles and Cindy, for your gracious hospitality ... we are ready to return! Rental includes pick up and return to the Guanaja Airport, a trip to town a week for groceries, use of our kayaks and our snorkel equipment. $250 to reserve (non-refundable) The remainder is due 30 days prior to arrival.